As part of the ongoing process of raising awareness in society of how ground construction can be adapted to a changing climate, we have produced an Action Plan. The Action Plan sets out a series of measures to adapt ground construction to a variable and changing climate, and specifies how they can be implemented and by whom. Extensive build-up of knowledge regarding the impact of climate change on ground conditions is crucial. The purpose of the Action Plan is to provide a basis for firm action, continuous dialogue and collaboration between those affected by ground construction. The proposed measures focus on the need in the community for new data and documentation dealing with the impact of climate change on ground conditions, as well as guidance and training for stakeholders in how supporting documentation in different forms can be utilised in spatial planning. Ground construction not only has an impact on different sectors but also on the responsibilities of other public sector bodies throughout the entire planning and construction process. To take account of this, the Action Plan is founded on SGI's remit to drive development and to mediate new geotechnical knowledge in the endeavour to improve the overall efficiency of the planning and construction process. 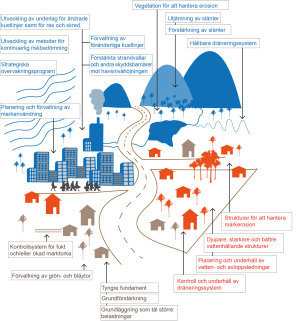 Illustration of potential measures for sustainable ground construction. Illustration SGI. Adapted from Shaw et al. (2007).